Deacon Cliff reminded me today that we are recognizing our graduating seniors. Since today is Trinity Sunday a day in which we are encouraged to preach about the Trinity, I have decided to preach directly to our young people (So mom and dad you can read the bulletin while I preach...Not really!). So my young people, today I will take this time to introduce you to someone, but, before I do this, I need to explain to you how I usually do this. In America, we usually introduce someone by saying “so and so meet so and so”. In Puerto Rico we do it differently, we use what I like to call the “What-How-and-Why” method. I can go into a long description of how to do this but I think it will be best if I give an example. Let’s say that I am going to introduce my wife to you. I will say something like: “So and so this is Nancy, my wife of 22 years, and the mother of my 4 kids”. With a few words, I have given you a general idea of who this person is and what her relationship is to me. The problem with introducing people in this way is that it is very one dimensional. My wife is much more than the mother of my children married to me for 22 years. For you to really get to know my wife, I would have to do this little what-how-why exercise hundreds of times. Now the person I will introduce to you today is The One True God, the Most Blessed Trinity, creator of everything that is visible and invisible. The way I’m going to do this is by presenting the-What-the-How-and-the-why of The One God. So imagine that the Blessed Trinity appears right here today and tells me “Deacon Harbey, I want you to introduce me to the people of St Michael’s parish.” I would say something like: “Hi people of St Michael’s, let me introduce you to God, The Father who IS The Son, and IS the special type of love The Father and The Son share”. You might be thinking that makes no sense. Do you remember when I said that just one “What-How-Why” statement is not enough to get to know someone? Well...When it comes to the Trinity there is only one statement we can say. Yes, we can say He is all powerful, all knowing, all present, but these statements only describe what God can do. They do not reveal Him in a personal way. In a personal way, we can only know Him as God who is The father, and The son, and the deep fraternal love They share with each other, which we call the Holy Spirit. How can this be? How can one being be three unique individuals? Well, in the Trinity, the What, the How and the Why, the action of being a father, the action of being a son and the active love between these two is so powerful that they become three living separate, independent, individuals(Not beings… There is only one God!). This is why we use the word “person” because they are different and each behave in a different way from the other. In a regular human being, the what-how-why is just one idea of who a person is. In the Trinity, this what-how-why is more than an idea; they are personalities. Are you confused yet? Wait until you hear this! These 3 personalities live and exist in a relationship, they behave towards each other as members of a family do. They interact with each other, they talk between themselves, they enjoy each other’s company, they praise and help each other. These are fundamental truths of our faith. If we want to call ourselves Christians, we have to believe all of this, however it is not necessary to understand it. In fact, we will never be able to. A father, who has a son and whose mutual love becomes another person, The Holy Spirit. Like I said, this is a great mystery of our faith; one which we should approach in great humbleness. 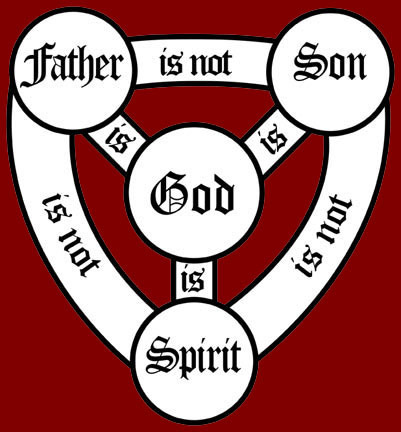 Now there is one more thing I would like to say about the three persons of the trinity. The most important thing I'm going to say today. The persons of the Trinity ARE real persons, they are not a thing or an idea; we can interact with them. If we talk to them they will listen, if we call on them they will answer, but if we pull away from them they will respect the freedom of our choices. God The Father, sent God The Son to teach us how, by baptism, we become sons and daughters too. Our destiny is to be active participants in this family which is the Trinity, the One true God. Sometimes sin pulls us away from this family, sometimes it actually breaks this bond. The only way we can re-establish this connection is through the Sacraments. Blessed be the Most Holy Trinity, who has shown us His mercy.